Insulated wall panels were designed from the need to create a fully contained climatic-controlled area, and also allow flexibility to quickly assemble or collapse the contained area based on the demands of your industries ever changing needs and operations. These custom built thermal curtain walls are based on your specifications. Feel free to use our easy measurement guide below and allow us to create a quote for you today. Warranty from failure in normal use due to defects in material or workmanship for a period of 5 Years. Lifetime warranty on all track and roller hardware. 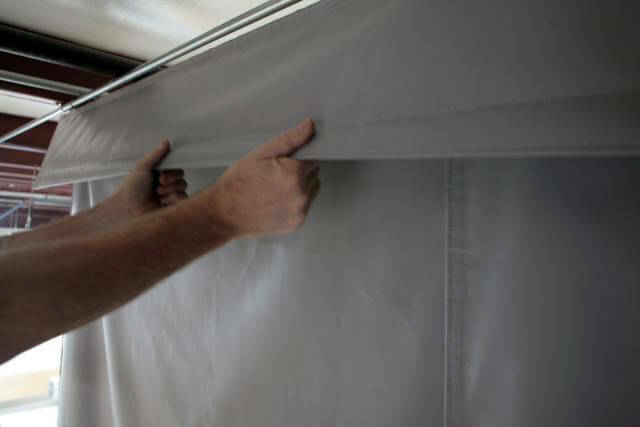 Curtain panels are constructed from double paneled 18oz vinyl walls lined with Thinsulate Ultra Insulation from 3M® to control temperature loss. Panels have an exclusive overlapping design that allows curtain walls to maintain an insulation rating of R-5, and with the use of multiple layers, it is possible to achieve an R-20+ rating. 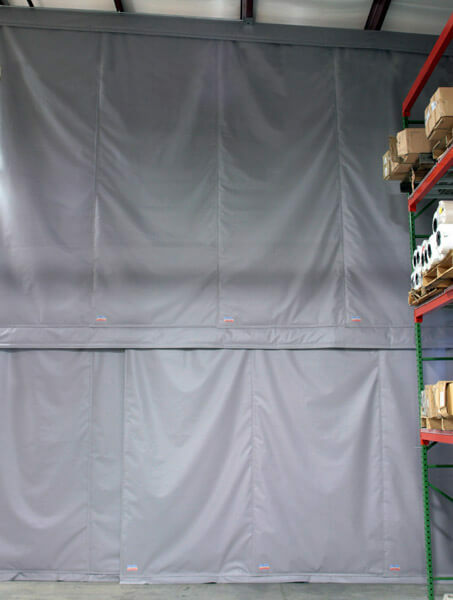 Insulated wall panels have a temperature rating between -30 °F through 176 °F allowing you to store a multitude of various materials, foods, and equipment. 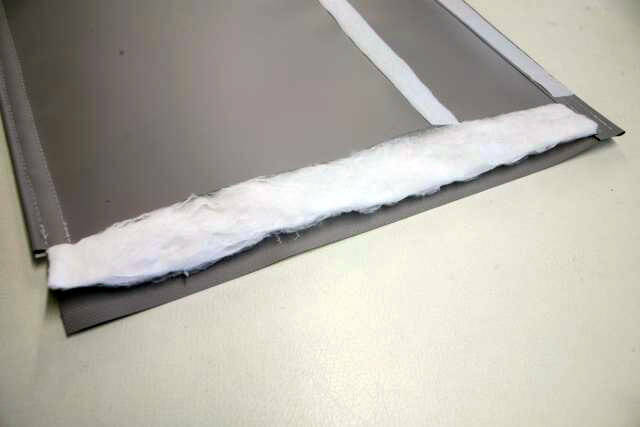 Temperate control is also achieved through the patented thermal valences and floor sweeps that maintain temperatures along the outer portions of the curtain walls. Freezer, Cooler, and Storage Areas - Creates isolated space that can maintain cold temperatures, temperature capabilities range -30 °F through 176 °F. Loading Docks - Flexibility to assemble and collapse a controlled space upon demand, allowing multiple temperature areas in one area. Food Processing Lines - Isolated cold areas without unneeded construction, able to house multiple temperature zones capable of preserving different food types. Warehouse Separation - Store multiple temperature delegated items under one roof with the option to move equipment and materials upon demand. Safety: NFPA 701 Standards for fire resistance. Durability: Double locked stitched using mildew and rot resistant thread. Privacy: The mobile capabilities of the climate control system are achieved through the galvanized steel track and roller system. 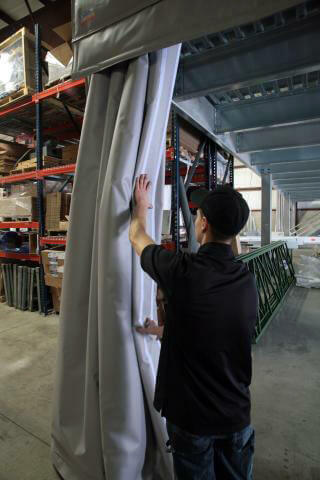 Insulated wall panels are assembled on a full hook and loop fastener system that roll along an industrial duty track. Control curtains come complete with all inter-locking hardware required to mount the custom designed thermal insulated curtain panels. 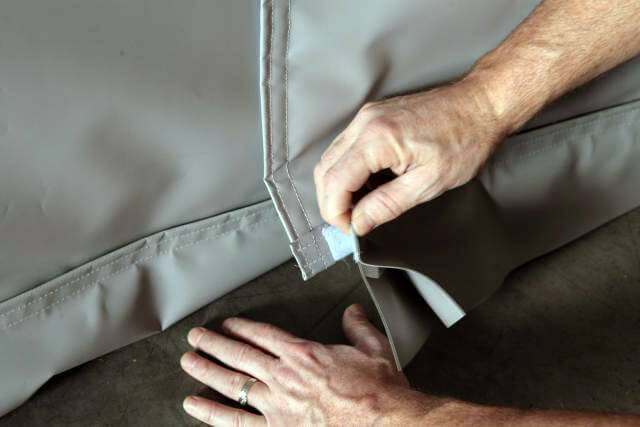 Design your own customized insulated curtains using our measurement guide below to create your own precise climate control curtain wall. Submit the required information below and one of our knowledgeable staff members will provide a quote within 48 hours. Includes End Mounts, Universal Splices (for flush or suspend mounting), 16 gauge galvanized steel track pieces and nylon roller hooks. 90 degree curves and other mounting hardware and integrated doorways are also available. Please fill out the form below in order to receive your quote and will be processed.